My very favorite class in the entire repertoire of everything I teach–ever–is my fit class. I taught it again a couple of months ago at Sew Modern in LA, and it’s such a thrill! It’s so much fun to explain and demonstrate how to make a muslin, with all the little tips and tricks that can be used to streamline the process of fitting and which can make it so easy. It’s so amazing to see how it opens everyone’s eyes and makes sewing for yourself so much less intimidating! But the reason I love to teach it so much is because it connects us to each other in such wonderful ways. 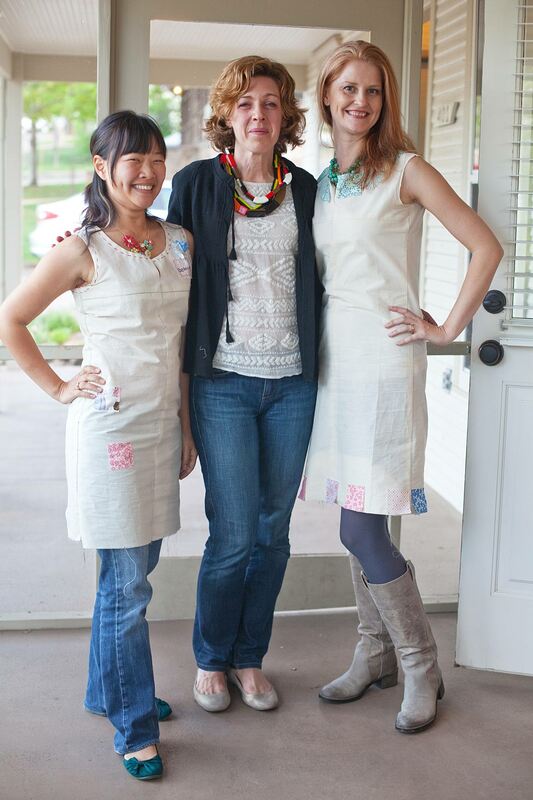 Makerie 2013: These two wonderful women wore their muslins to dinner! We don’t touch each other very often, do we? Even among dear friends, aside from a hug or kiss in greeting, we tend to maintain a respectable distance from each other. But in a fit class we’re taking measurement and adjusting fabric and demonstrating changes on each other, and that results in talking about ourselves and our bodies, which in turn creates a really unique bond. We make ourselves so vulnerable for a little while, and at the end of each class I feel energized and so grateful and connected to everyone who opened themselves up and shared that time together. We develop a connectedness that I rarely experience elsewhere, even among my closest friends. It’s a different kind of connectedness, and I feel so incredibly grateful and thankful to be able to share it each women I teach. It’s such a wonderful feeling to watch a woman who has never been able to find clothing that fits her properly discover that her body is just fine, that clothing can actually fit and can make her look and feel amazing! I think that as women we’re so critical of ourselves, and when you learn how easy it really is to sew for yourself you also learn to accept your body and enjoy it. We don’t need to feel embarrassed about our shape or size. 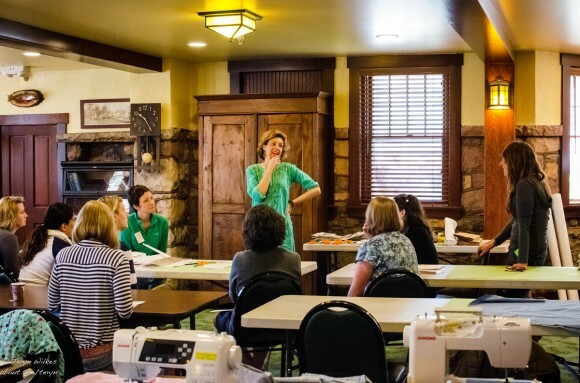 It’s just a simple matter of learning how to adjust a pattern to fit our own body, and once we’ve developed those few simple skills it opens up the world of sewing. But it also enables us to accept ourselves like we’ve never done before. 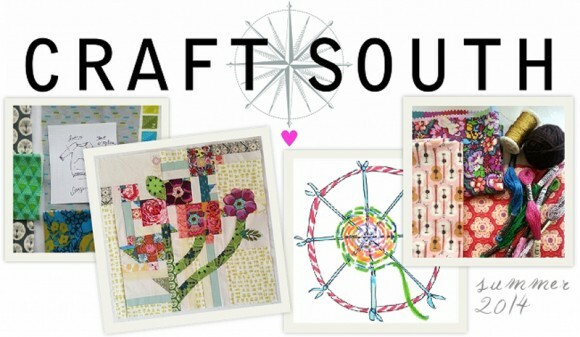 I’m pleased to say that I’ll be teaching my fit class for one of Anna Maria’s new Craft South weekends in July. Last time I was in Nashville Anna and I went out for dinner and had a wonderful time together. This time we’ll get a chance to teach together in a beautiful studio space, and she’ll be opening her home to everyone who attends. Doesn’t that sound like fun? Bluegrass music, drinks in the backyard, I mean…come on! For the time being, this is the only fit class on my schedule this year. So I hope you can come. We’ll have the luxury of spending two days together, and my goal is to send everyone back home at the end of the weekend with a new-found confidence and enthusiasm about sewing for yourself. Fit isn’t that difficult, no matter what you’ve heard or been told. Craft South will feature a different guest instructor each month: Amy Butler, Natalie Chanin, Heather Ross. So exciting! Enrollment opens on Monday, so if you’re interested you might want to get your ducks in a row over the weekend. Oh, how fabulous! I want to come! oooo, that is tempting. I will probably be in the south in July…. I am so bummed! I saw the announcement and was super excited that you’d be coming Down South, and that is the ONE weekend in July when we already have plans. Curses!! I know you’ll have an amazing time–be sure to get some BBQ from Jack’s BBQ downtown, it’s the best in Nashville!! Melanie, I hope you’ll come! And Deborah, sorry I’ll miss you! Maybe you can go when Amy or Natalie or Heather are there. I know each of these weekends are going to be great! What a lovely experience. I occasionally visit and help new mums with breastfeeding and a lot of what you describe above, is true for that too. You really can’t help but create a connection. Have a lovely time helping women make beautiful clothes for them selves. You’ll have to plan a world tour, Australia and then Germany! Jessica, yes! Definitely trying to decide when (not if) to go to Australia! Sigh! I wish! Met AMH at a quilt guild meeting where she was giving a presentation and she’s really lovely. The two of you together will be magical! It’s so ironic that I woke up to see this post in my inbox this morning! I was up so late last night after making three muslins (failed) for my teenage daughter’s Easter dress. It’s a fitted dress and I just can’t seem to get it right. I went to bed so discouraged. I would love to take your class, and I’m only an hour away! Oh yes!!!! I know from experience how long a plane journey it is from New York to Australia but you would be so welcome Down Under, Liesl. It would be wonderful to meet you, Todd and S. Perhaps in your summer?? I am debating about Nashville. Do you have any plans for teaching a class in the DC area any time soon? This looks AMAZING! Incidentally, just to plug the fit class — I took the 1-day fit class at Sew Modern in LA. It’s not that I couldn’t follow the steps of fitting with a muslin that I’d read in books or online. Each step individually seemed logical to me. It was more that it just didn’t ‘click’ in my head when I was only reading it. I feel like this is one of things where it’s just a lot easier to do it in person, especially because fitting a bodice on yourself is tricky to do. Another pair of hands helps a lot. And maybe this is just me and my inexperience or having felt intimidated, but I felt more confident in having Liesl’s opinion on whether something was fitting appropriately, with enough ease for free movement but no so much that it was baggy. That kind of thing is a bit of a judgement call and it was really helpful for me to have somebody whose eye for such things I trusted help me decide what was working best for my shape. Just my 2c! I’m in! Clothing has always been a weak point for me. This will be well worth the trip! Not to mention I’m so excited to be learning from Liesl and Anna Maria!! Nancy and Carrie: I can’t wait! Lucky lucky Nancy and Carrie, have fun! I just signed up! So excited! I just signed up!! Excited just isn’t a big enough word for how I feel! Once in a lifetime experience here I come!!! Where can I find postings of upcoming fit classes? Nancy, there are none scheduled right now, but we always announce them on the blog. We’ll be blogging upcoming workshops as well as including them in our newsletter, Nancy, so if you subscribe to either (or both!) you’ll get advance notice.